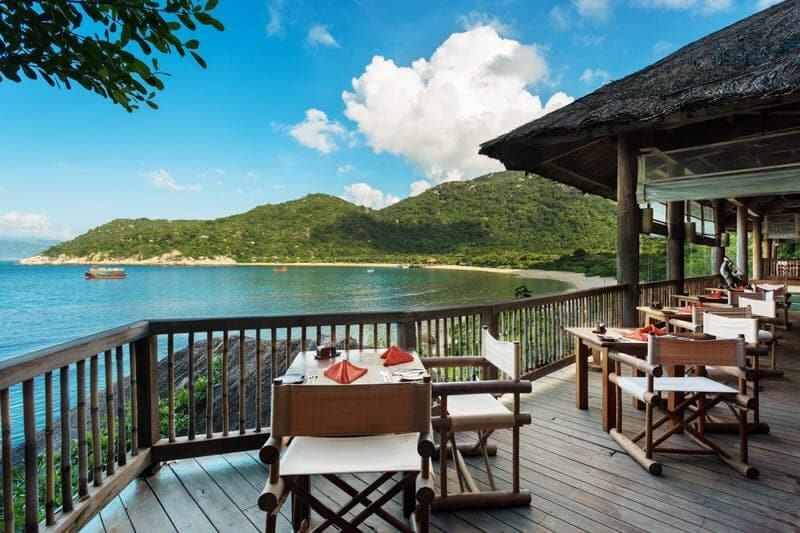 Six Senses Ninh Van Bay is a beach getaway destination for the rich and famous and is Vietnam’s most exclusive resort, being accessible only by boat. Six Senses Ninh Van Bay is situated north of Nha Trang on a calm bay with a golden sand beach and surrounded by tall boulder-strewn mountains. A total of 58 personal luxury villas are nestled along the beach, hilltops, and rock formations, each coming with a private plunge pool and butler service. Guests come here looking for privacy, relaxation, tranquility, and luxury. On our recent trip to Vietnam, we had the very exciting opportunity to spend a night at the Six Senses Ninh Van Bay and experience this exclusive resort for ourselves. We’ll share all the details and photos of our stay and tell you how you can arrange your own luxury stay at this little piece of paradise. 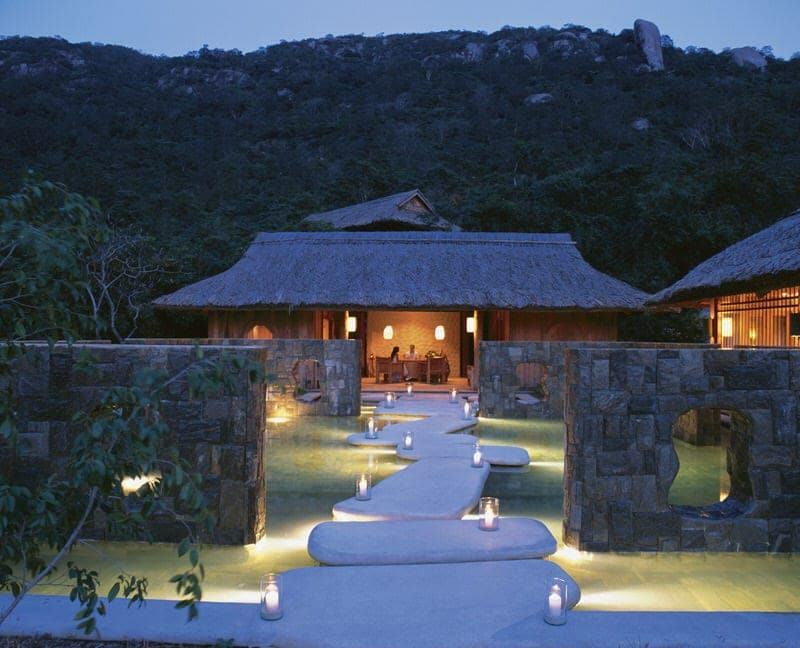 Even if this is out of your Vietnam travel budget, we hope you’ll enjoy a glimpse into this beautiful resort. The resort is located on Ninh Van Bay on the southern side of the Hon Heo Peninsula. 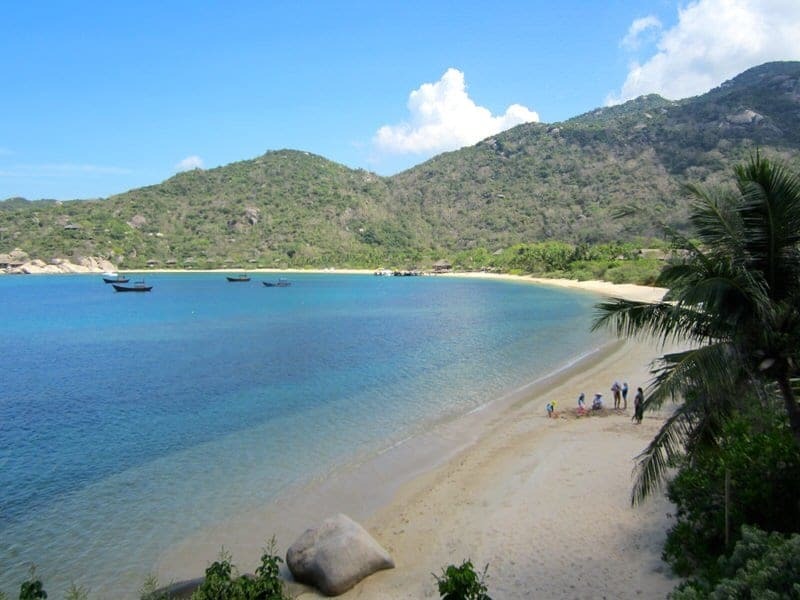 It is north of the popular beach city of Nha Trang and can only be reached by boat. The nearest airport is the Cam Ranh International Airport (CXR) located south of Nha Trang. Your paid transfer from the airport (or train station in Nha Trang) to the resort will be arranged by Six Senses after booking. 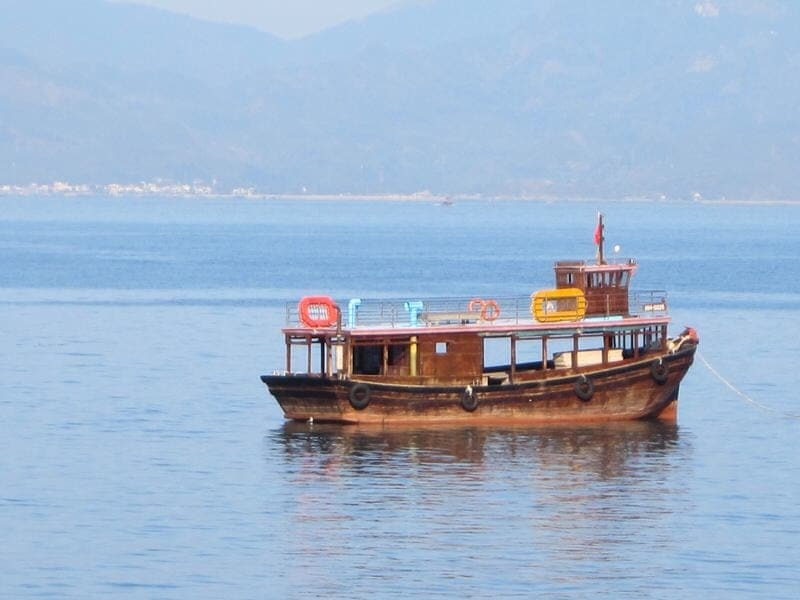 The road transfer from Cam Ranh International Airport to the Six Senses Lounge takes approximately one hour, followed by a 20-minute boat transfer to Ninh Van Bay. The cost of renting a villa at Six Senses varies quite a bit due to season and villa type, but rates range from a low of about $600 per night to a high of about $2,700 per night. You can check current prices here. During peak season 5-night stays are often required. If you are looking for a luxury beach resort in Nha Trang, but can’t afford the Six Senses Ninh Van Bay price tag, you might also check out their sister property, Evason Ana Mandara, in Nha Trang. 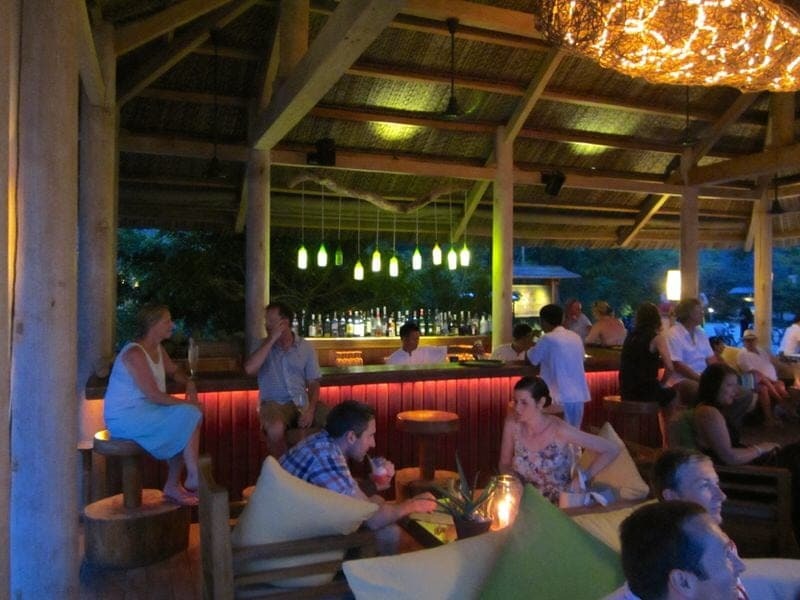 Evanson Ana Mandara is managed by the same company and is still expensive as a 5-star luxury property, but a bit more affordable than the Six Senses Ninh Van Bay. 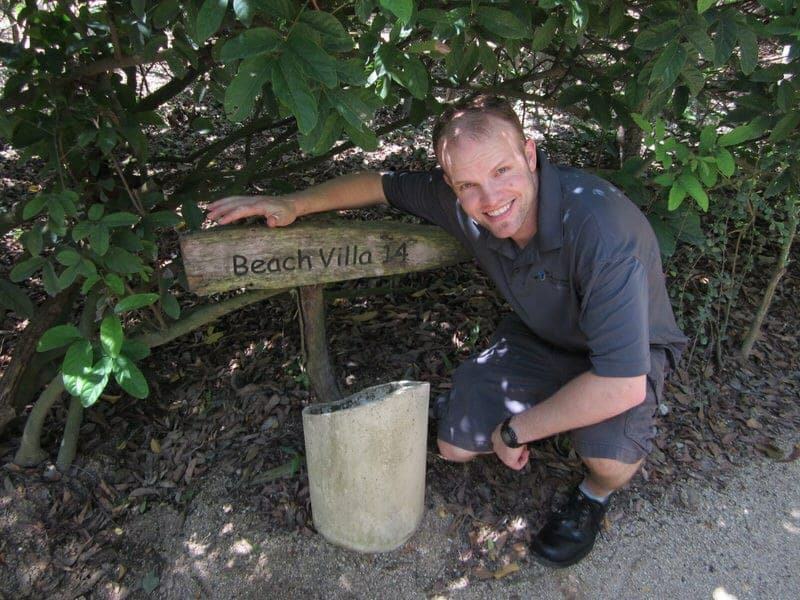 Contact Information for Six Senses Ninh Van Bay? Prior to coming to Six Senses Ninh Van Bay, we had spent two nights in a small apartment owned by a local in Ho Chi Minh City we rented via Airbnb. We enjoyed our stay there and adored our host, but it was definitely a budget stay and not even close to luxury. Each morning around 4:30am we were woken by the neighbor’s rooster, the only sink was in the bathroom located outside the apartment, and it was quite warm in the evenings even with a fan. So as we jumped on our early morning flight from Ho Chi Minh City to CXR to go to Six Senses Ninh Van Bay, we were very excited as we needed a break from sightseeing and cultural immersion, and simply wanted a place to escape and relax in the middle of our trip. We didn’t really know what to expect as we’d never stayed at this type of resort before, but we had very high expectations for the quality of our stay. After collecting our baggage at CXR, we were met by a member of the Six Senses staff who was holding a sign with our names on it. He greeted us and led us to a waiting Six Senses Mercedes shuttle van and were introduced to the driver. The van was very nice and we were given cold bottles of water and some reading materials were provided in the pockets of the seats. The van was very nice and could have held several more people but since we were on the 6:00am flight we were, not surprisingly, the only people arriving at that time. The ride from the airport to the Six Senses Lounge and boat dock took about an hour, so we read, stared out the window, and wrote a bit in our travel journals. The route took us right through Nha Trang and we were able to see the beach and water on one side and some Cham towers on the other. Nha Trang is one of the most popular beach destinations in Vietnam and we hope to be able to come back some day to explore this town further. However, we were told the public beaches can get quite crowded here although at 7am they are quite deserted and stunning. On arrival at the private Six Senses Lounge and boat dock, we were taken to the lounge waiting area, greeted by a very friendly woman, and given cups of ginger tea. There were also reading materials here as well; however, we were here less than 10 minutes before the boat was ready. We then got on board the speed boat, were given life jackets and offered water, and enjoyed the 20 minute ride across the bay. The firsts sights of the beach and rock villas made us very excited. The whole Ninh Van Bay area is very stunning, particularly in the early morning hour of our arrival. Getting here is part of the journey! We were greeted on the boat dock by several staff who helped us out of the boat and took our luggage. We also met our personal butler here, Thai, who then led us to a waiting golf cart where he gave us a quick tour of some of the resort’s sites (beach bar, main pool, activity and sports center) and then onto our beachfront villa. Thai led us around the villa, explaining various things (light switches, phones, minibar, etc. ), completed the check in process with us, and gave us some information about meal times and options, activity schedules, and how to book services at the spa. He told us how to reach him as he would be our dedicated butler during our stay and then left us to get acquainted with the villa. We found a basket of fruit, a brief note from the general manager, and a bottle of champagne as welcome gifts in the villa. We had arrived! 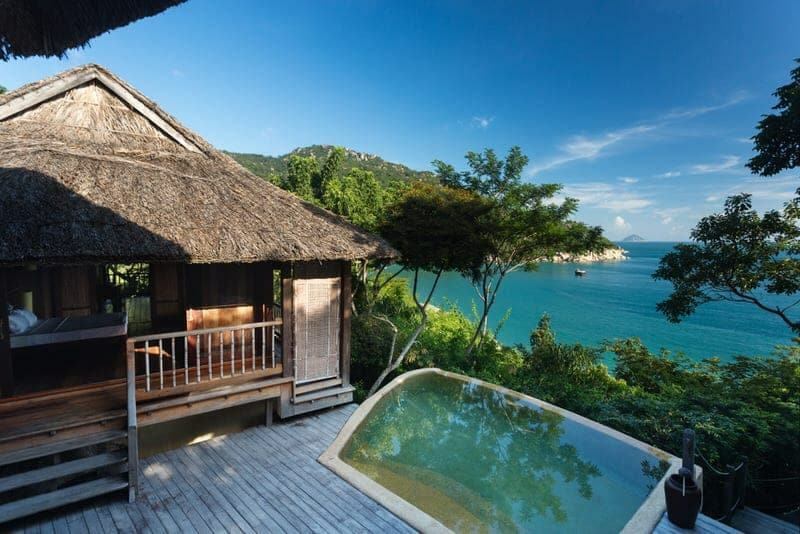 There are actually five types of personal villas at Six Senses Ninh Van Bay with the primary difference being their location (set on beach, water, hillside, or among the rock formations). 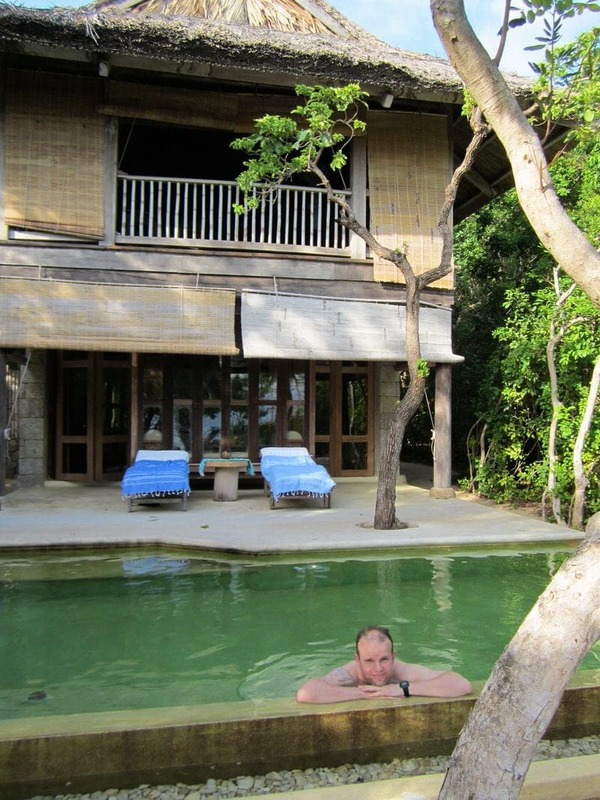 We personally stayed in a Beachfront Pool Villa, and specifically Beachfront Villa #14. The ground floor of the villa consisted of a bedroom (the only air-conditioned room in order to conserve resources) and a very spacious open-air bathroom. Access from the bedroom led to our private lounge area and plunge pool and from here was a short direct path to the beach. The top floor of the villa contained the mini bar, coffee maker, a desk, and a large lounge area. 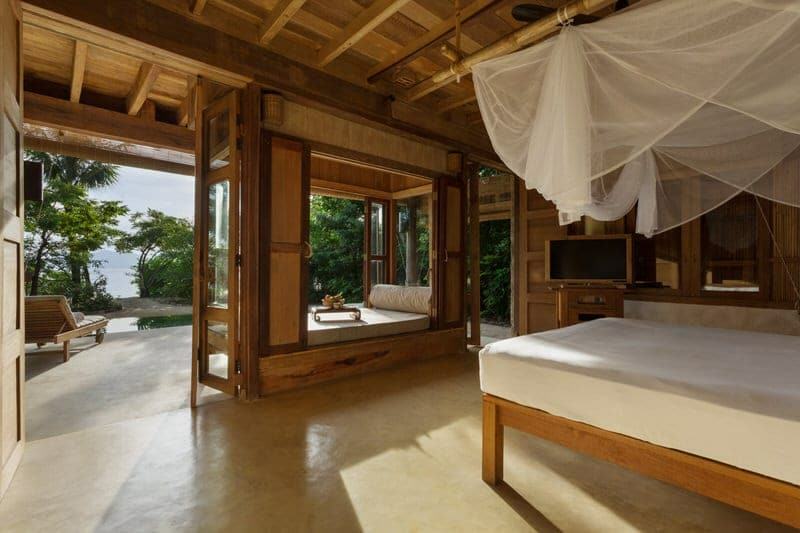 Elements throughout the villa were meant to blend into the natural environment as much as possible (lots of wood colors) and to be as natural and green as possible. 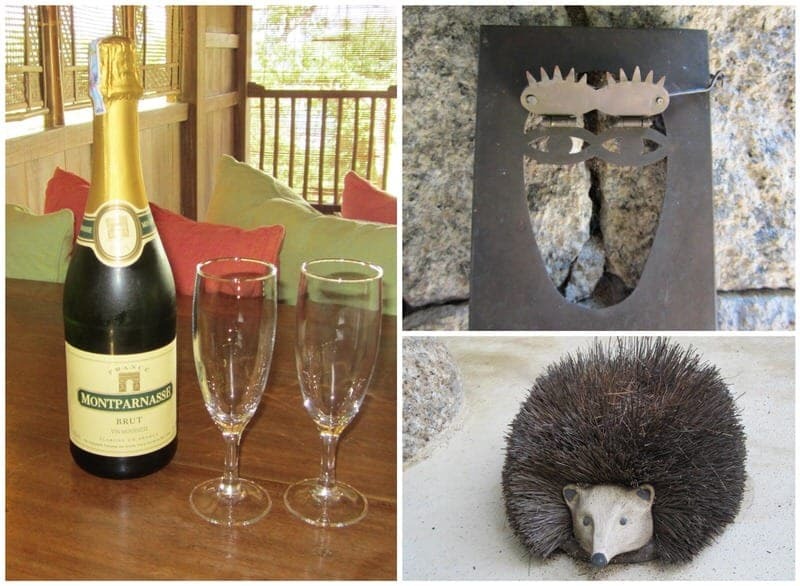 We really had no complaints about the villa and we would have loved to have remained there for a whole week. You really feel secluded and it is the kind of place you could imagine writers escaping to so they could finish their books. Sadly, we didn’t have enough time to write a book, but we discovered that there were several locations within the villa that were great places to read, write, and snooze. Even though you can imagine that you are alone on a deserted island, it’s not quite like Robinson Crusoe as you have all the typical technological creature comforts such as a TV, wifi, minifridge, safe, coffeemaker, A/C (bedroom only), and telephones. It reminded me a lot of a luxury safari villa as you are quite close to the nature and it does sometimes blow, fly, or crawls inside. So just be warned that you may be sharing your villa with a few guests, primarily upstairs and in the bathroom as you have more control of the bedroom. 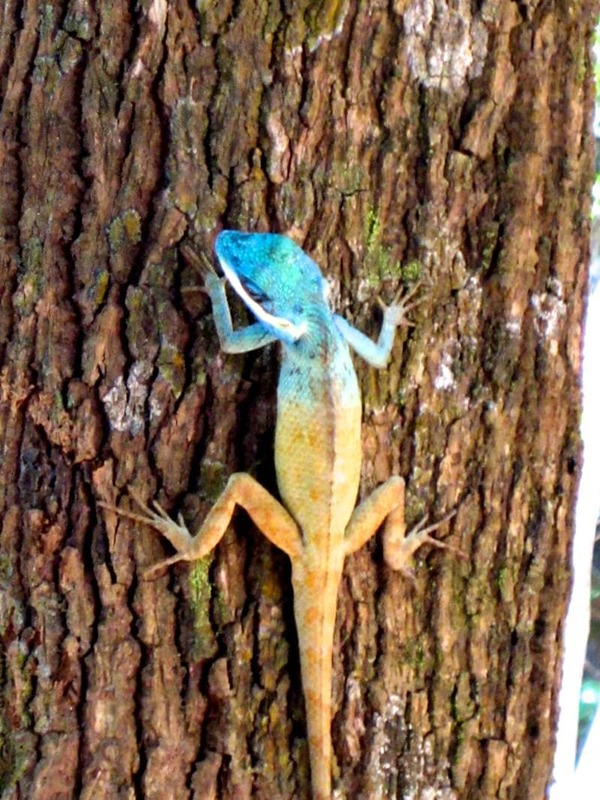 In our case we had several resident geckos which we personally quite delighted in seeing and we also noticed a few mosquitoes flying about in the early morning. 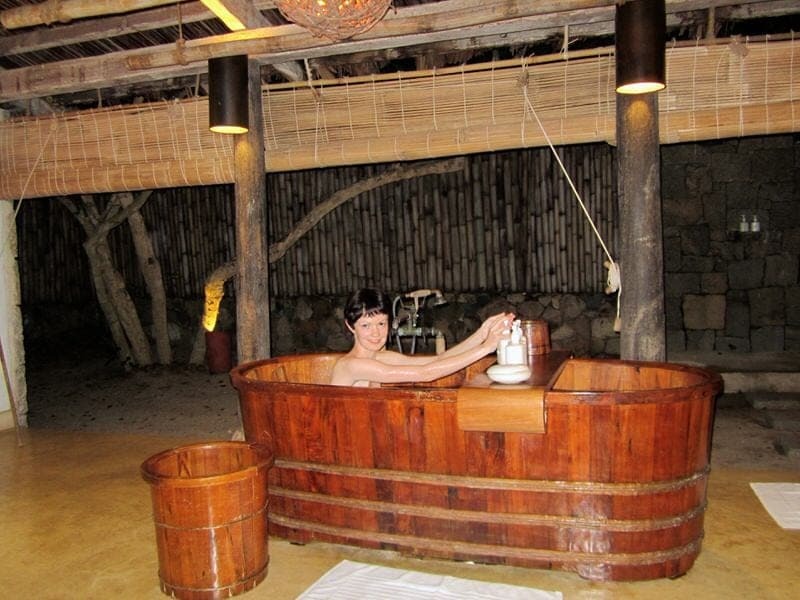 I was very excited by the wooden bathtub and the outdoor shower, and enjoyed the sensation of being able to essentially bathe outside in one’s private yard. The bed was very comfortable and we enjoyed the scented pillows (e.g., lavender, lemongrass) provided at turndown which you can request with your preferred scents. 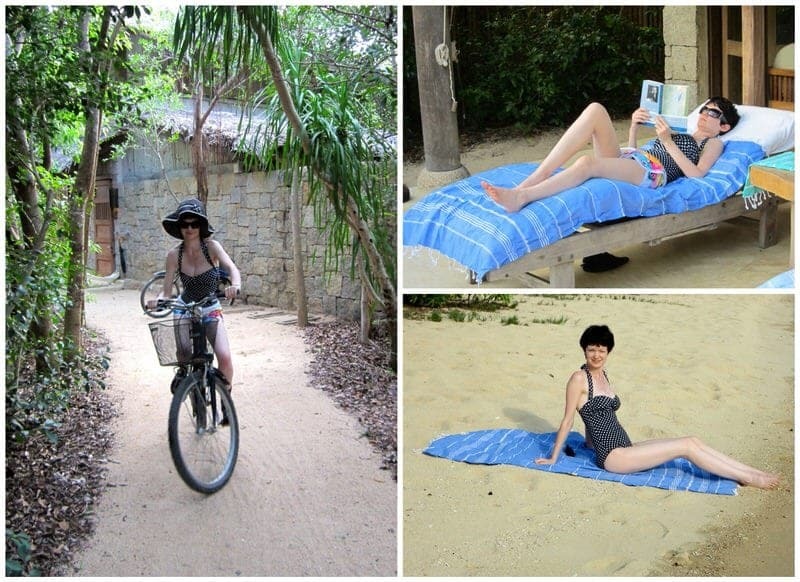 We also appreciated all the little extras included in the villa such as the use of the two bicycles, hats, beach bag, robes, lotions, etc. that helped make our stay just a bit more pleasant and convenient. 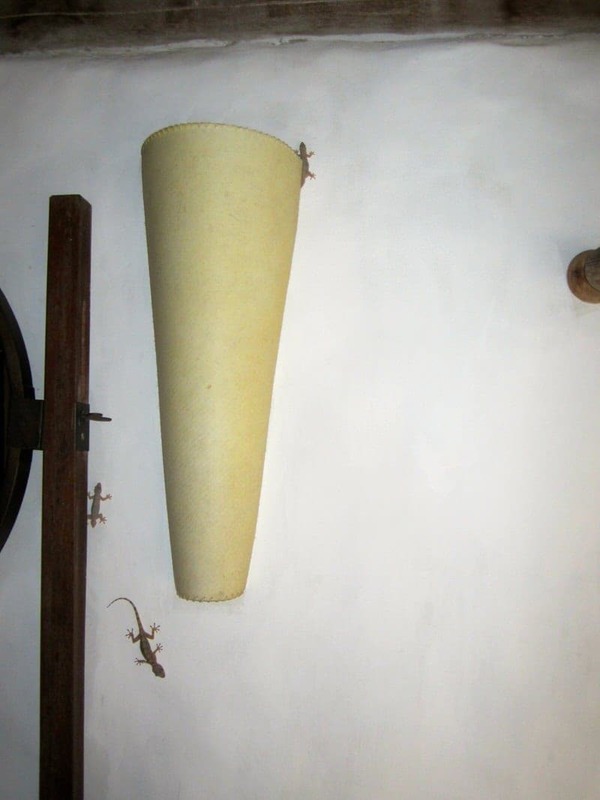 our resident geckos – how many can you spot? 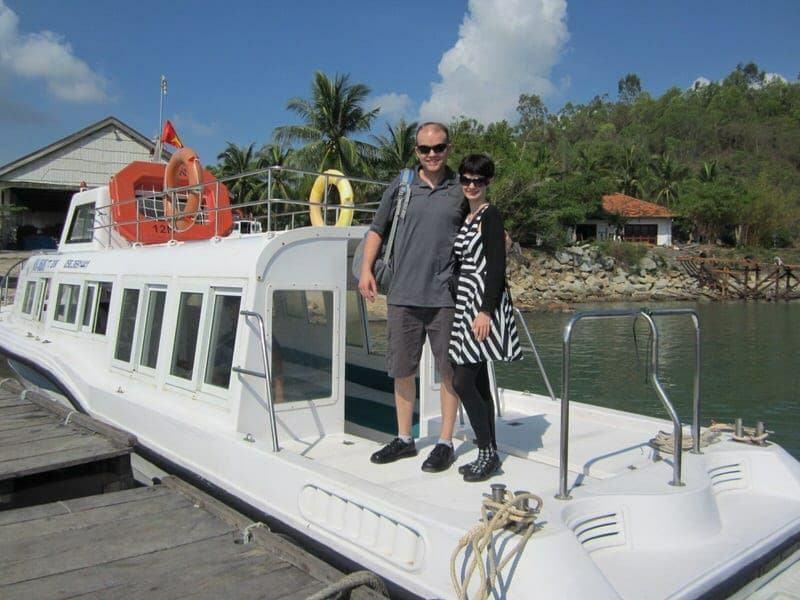 Given that we were not here just for fun and games, we did take a tour of the property with the friendly Sales Supervisor, Mr. Lai Huy, to learn more about the resort and to see the various resort facilities and visit all the villa types. Although all villas are quite similar as far as layout and amenities, some are 2-story and some are two split one-story pavilions. Others have been renovated to be more family friendly with two bedrooms. As you might imagine in a five-star luxury resort of this caliber, the service was really great. The arrival and check in process was long and involved multiple transfers, but we were impressed by how smoothly and professionally this was handled. Our butler, the food and beverage staff, and the sports and activities staff were all very friendly, professional, and helpful. Ethan had a particularly great experience with the friendly Experience Centre staff when borrowing a kayak and discussing snorkeling options. While the General Manager was out of town during our visit, we had the opportunity to spend some time chatting with the Resort Manager, Abhijit Ghosh, and he was quite friendly and knowledgeable. At the end of our trip, we also had a good experience checking out and everything was arranged the night before and happened as planned the next morning. Our butler even checked our morning flight for us with the airlines, finding that Vietnam Airlines had changed the time of its flight and our schedule was adjusted accordingly with no problems. Note that tips are best given at the end of your stay rather than tipping as you go, so just make sure you add any desired tips when checking over your bill at Reception before your departure. The one let down for us during our stay was when we called to ask questions over the phone. We thought the calls would go directly to our butler Thai, but instead they were routed elsewhere each time and we did not know how to get a hold of him directly. There were at least three times we called and the staff member could either not understand or answer our questions. We actually think it was the same female staff member answering the phone that afternoon and we think the issue was that she could not understand our English well enough to answer our questions. So each time we’d have a somewhat frustrating conversation followed by a follow-up call from another staff member a few minutes later to try to address our questions. Given that these were concerning minor issues (requesting a pair of sandals, inquiring about dinner options, asking about opening hours of reception), we were a bit disappointed that a person with better English skills had not been assigned to cover guest calls. Our understanding is that it can be difficult to recruit and maintain staff members in this area due to the relatively small labor supply and the great need for staff as many new hotels and resorts open in Nha Trang; however, we do hope this issue is addressed. However, other than this one minor annoyance, we did not have any other complaints during our visit and felt that the service was quite superb in all other areas. 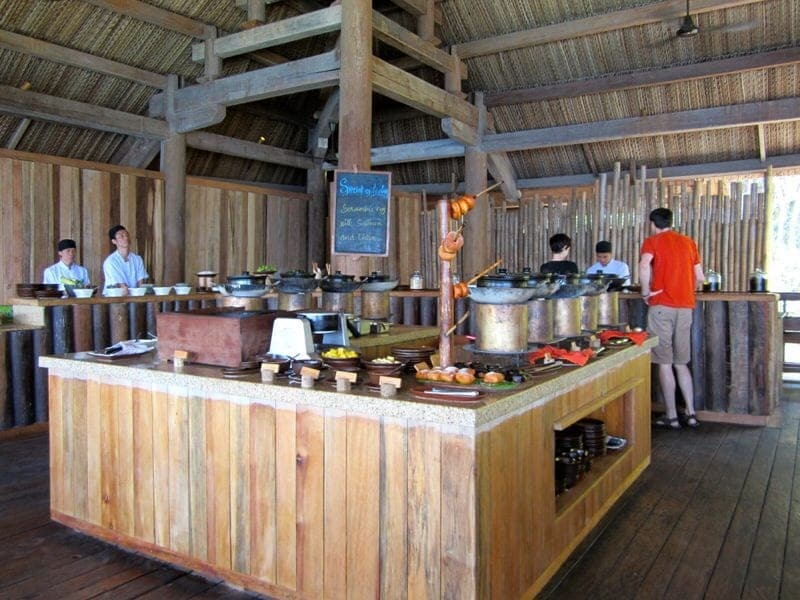 There are three restaurants at the resort. Dining by the Bay which offers buffet breakfasts and a la carte lunches and dinners, Dining by the Pool which offers a la carte lunches during the day and seasonal themed dinners in the evenings. Dining by the Rocks is the most exclusive of the three offering a more intimate location, both fixed and a la carte menus, and a great location to view the sunset. Drinks are available from the bar Drinks by the Beach all day and from Drinks by the Bay bar in the evening. 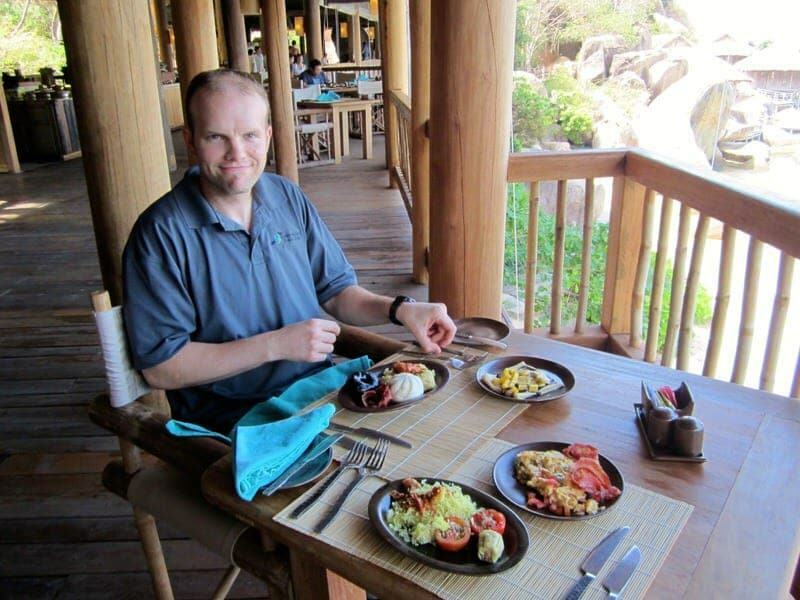 The dining options extend beyond the three restaurants and if you plan ahead, you can arrange for meals on the beach, on the jetty, in your private villa, or in the resort’s wine cave. During our 24-hour visit, we ate two buffet breakfasts at the large Dining by the Bay restaurant, which were very good. For breakfast, there were plenty of both hot and cold food options (American, Asian, and European) and a couple of cook to order stations. We also had dinner at Dining by the Bay, which offered both regional and international dishes on its a la carte menu along with an extensive wine and drink menu. We specifically ordered the Market Seafood and Meat Hotpot for two, which includes a large plate of fresh meat, seafood, vegetables, and herbs that are cooked at your table and served with noodles. This was delicious and so filling we didn’t have room for our planned dessert! We also had drinks at the Drinks by the Beach. 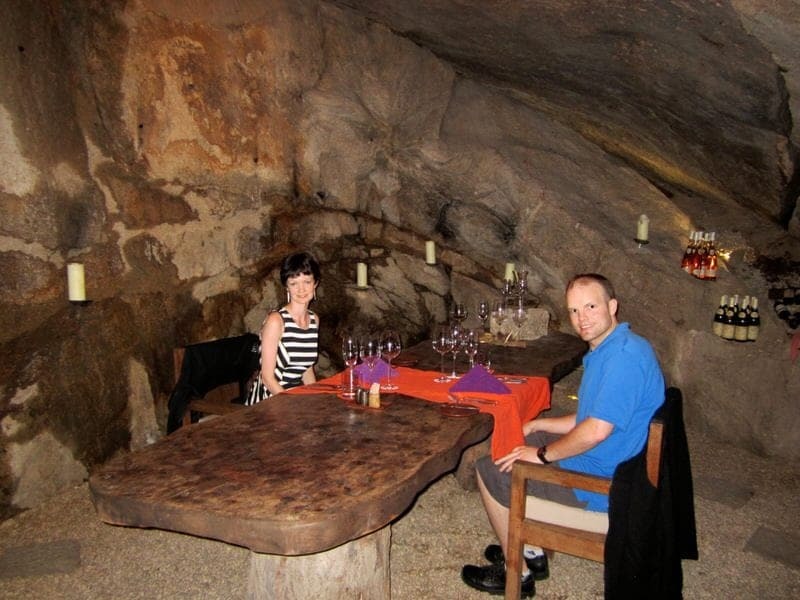 We had no complaints about the quality of food or service at the restaurant or bar. 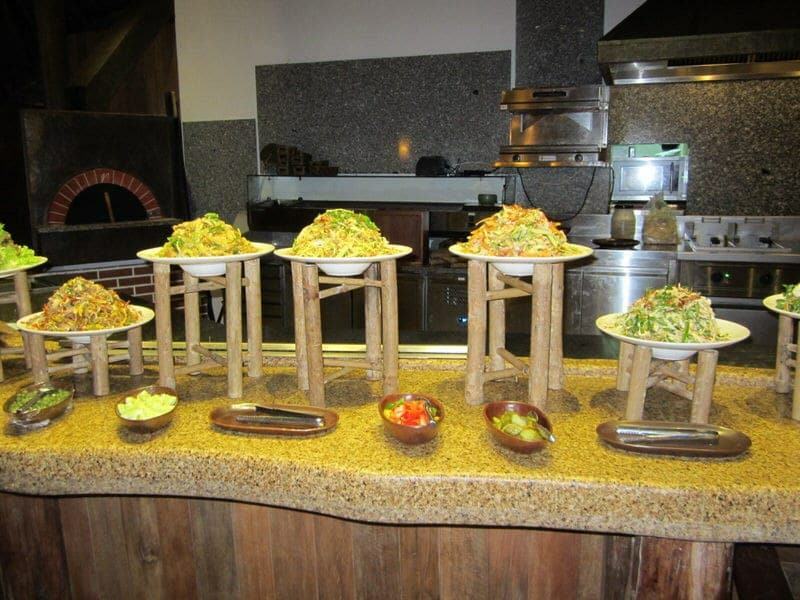 themed Vietnamese buffet dinner at Dining by the Pool – looked great! 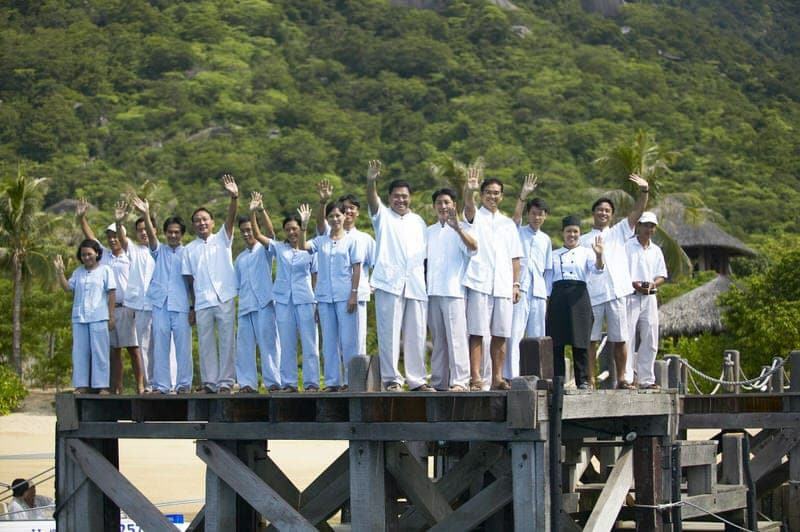 There are numerous activities to choose from while you are at Six Senses Ninh Van Bay. These include windsurfing, diving, water-skiing, tennis, hiking, paddle boarding, snorkeling, canoeing, fishing, badminton, and much more. 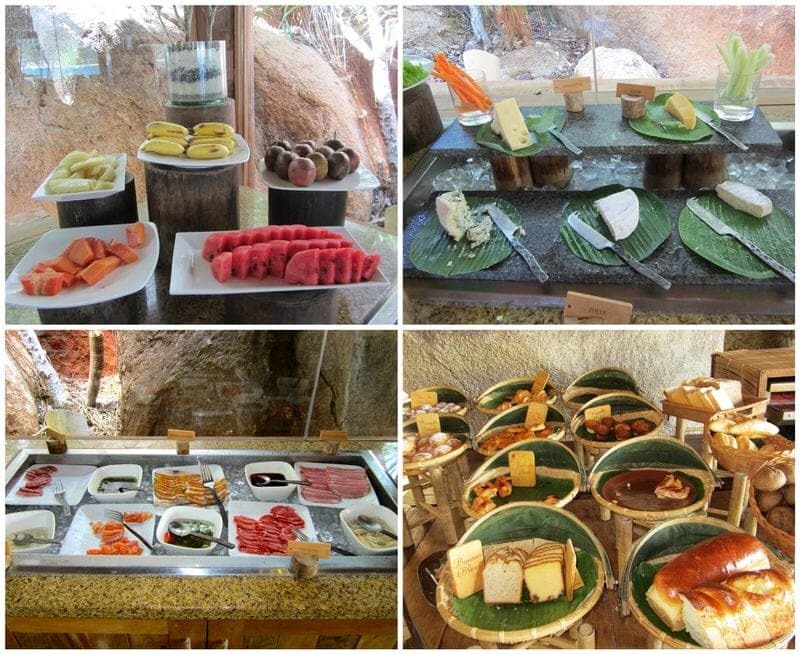 Cooking classes take place often and include the use of fruits, vegetables, and herbs grown in the resort’s own organic garden. Exercise equipment is available in the gym area and complimentary yoga mats are available to be used wherever you like. Those seeking pampering, will be well taken care of at the Six Senses Spa which offers its signature award-winning services as well as traditional Vietnamese treatments. Spa services may also be arranged in private villas. Boat charters and romantic cruises can be arranged, as well as trips to the mainland for cultural tours and shopping with a local guide. 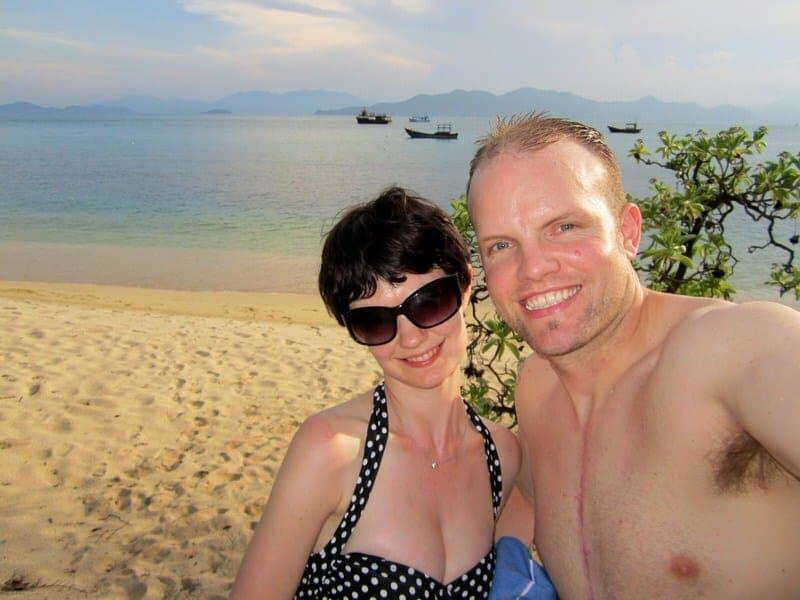 Both long and short hikes can be arranged, including hikes to Bai Nho (the private beach). While hiking, you might get to see some rare species including the native black-shanked Douc langur. 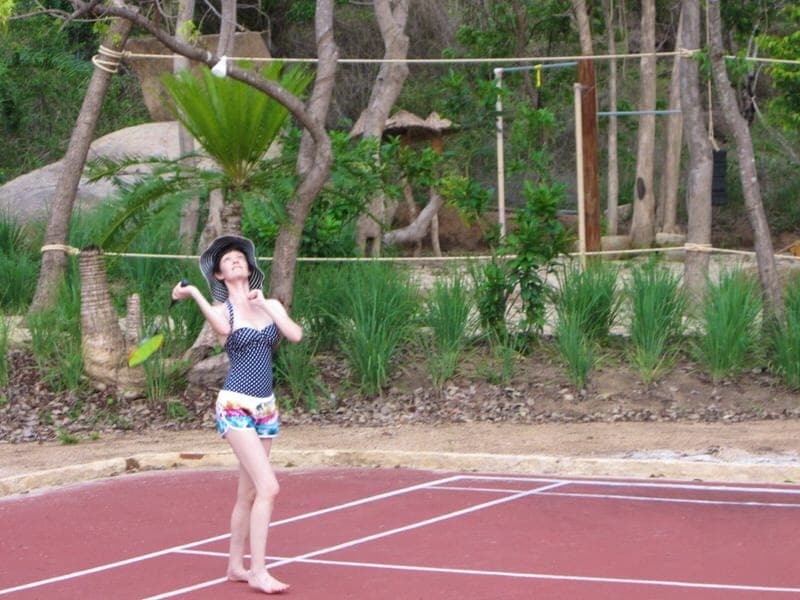 Each day the resort has a calendar of special activities that have been organized for guests such as barbeques, happy hours, children’s events, complimentary wellness activities, cooking classes, yoga, communal hikes, outdoor movies, volleyball games, guided kayak tours, etc. For children and families, the Sub Club is open daily offering games, a soft corner, arts and crafts, a Wii, and a collection of movies. The Pirate’s Lair is a children’s playground and offers activities such as beach games and sand castle competitions. We only had one day so we didn’t get a chance to do even half of the things we would have liked to have done. Over the course of the day we played fuzzball, played two games of badminton, swam in our private pool, laid out and swam at the beach, and read in the villa. We also took our bicycles on little rides to enjoy the beautiful resort. Then in the evening we went to a Guest Gathering Hour, in which all guests were invited for free drinks and appetizers and a chance to meet the other guests. The event also included music and some local arts and crafts activities. Then after dinner we went to Reception and requested a movie (complimentary) to watch in our room; they gave us the requested movie on a thumbdrive to watch on our villa’s TV. We thoroughly enjoyed the day and the great thing about all these activities is that they were all complimentary. We loved that there are no rental fees for the sports gear (kayaks, snorkeling gear, badminton and tennis equipment, bikes, etc.). Essentially you can pay as much or as little as you want for activities here, depending on your budget and what you want to do. 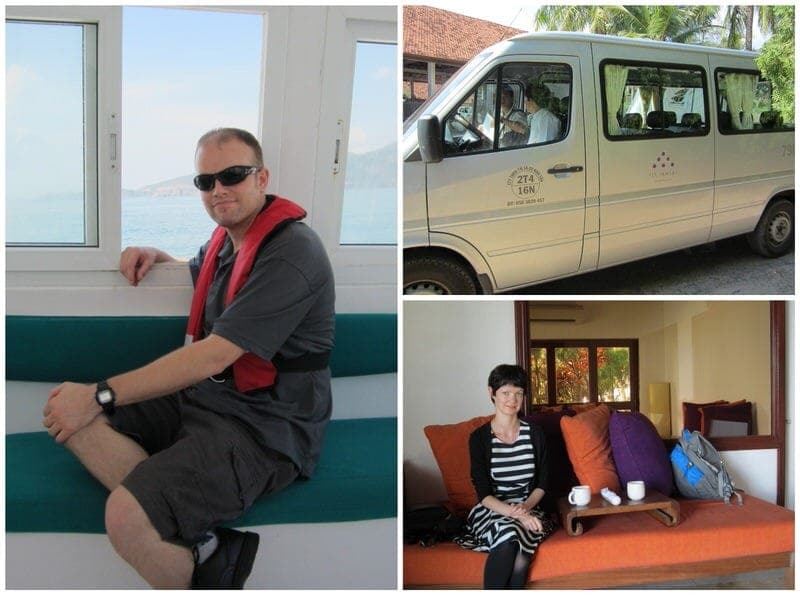 We had a very enjoyable and relaxing stay at Six Senses Ninh Van Bay and it truly did feel like a day in paradise. With the exception of the one issue communicating with a staff member on the phone, we thoroughly felt pampered and enjoyed excellent service. We were very impressed on the coordination of our arrival and departure. 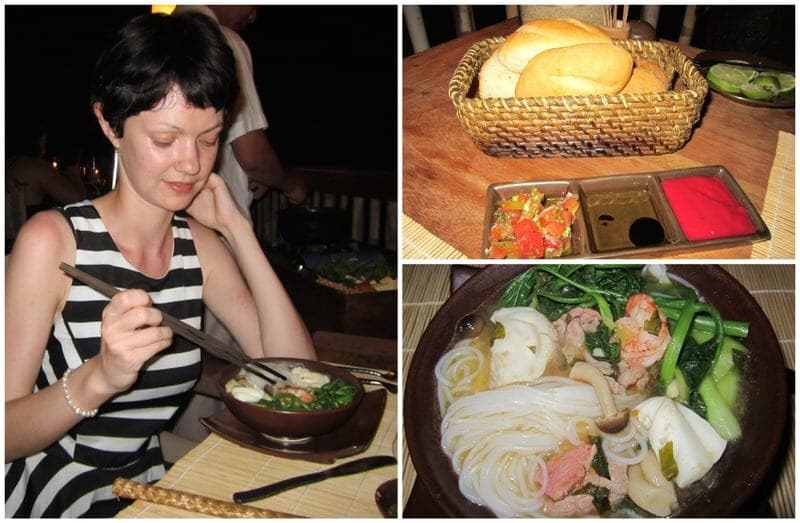 Although we only stayed one day, the food was good and we felt there was a lot of variety. There were numerous activities available for both adults and children, and we felt there would have been plenty to keep us occupied for several days. Although the real star is the villa itself and we would have been more than happy to spend a couple of days just holed up there enjoying the peace, taking dips in the private pool, and relaxing on the beach. We also really enjoyed how the resort puts a lot of effort into green and sustainable practices, and how the villas do seems to merge into the environment. The grounds, the bay, and the villas are just beautiful and stunning. From almost any vantage point at the resort, you are treated to absolutely stunning views. It is really no wonder that this resort has won so many outstanding traveler awards, including taking 3rd place of the Most Beautiful Resorts in the World in the 2013 Traveller’s World Award. Is the resort worth over $600 per night? This is a question that only you and your bank account can answer. If you are interested in staying here, you can check out available and rooms prices to find out if it is available during your trip. 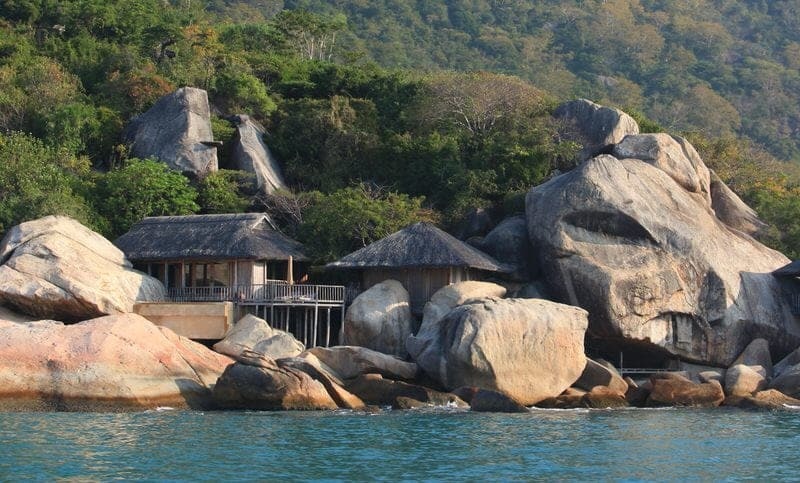 What do you think of Six Senses Ninh Van Bay? If you were visiting, which of the five villa types would you choose to stay in and why? As always, we love hearing from you! Great post! 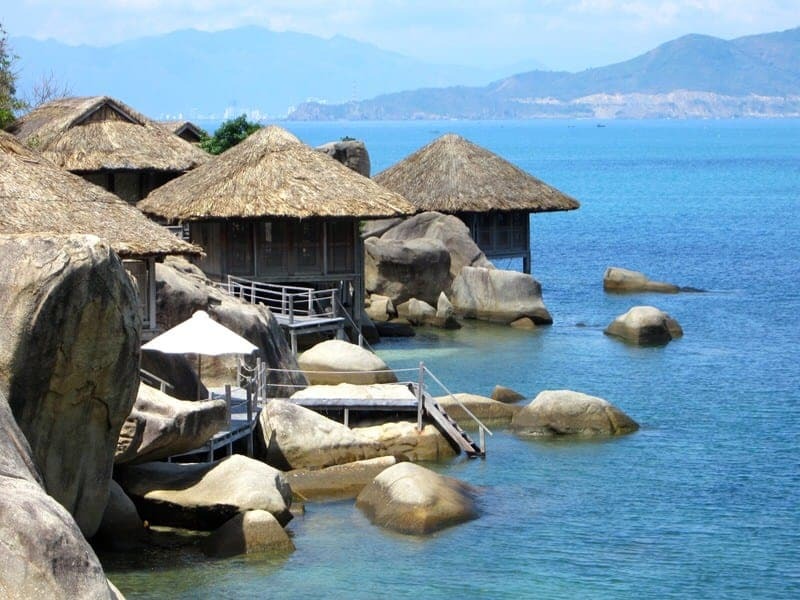 I think this fantastic resort is considered the hidden gem one in Nha Trang. 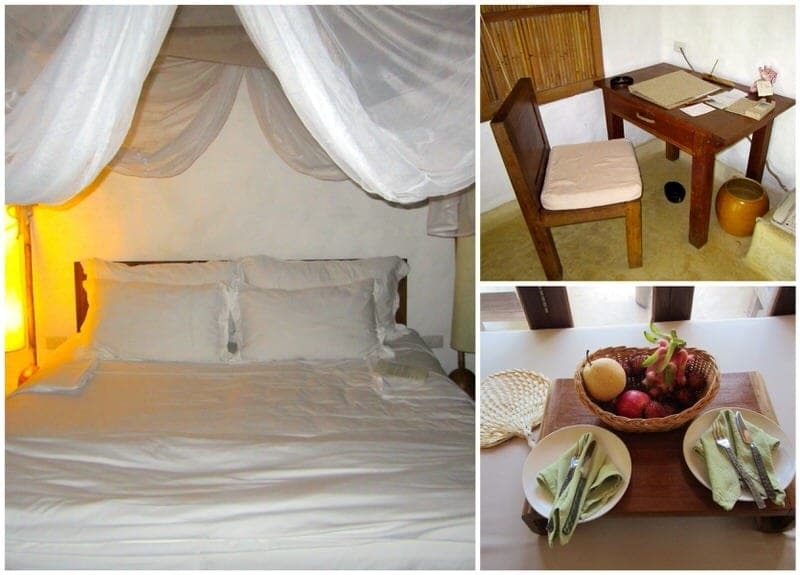 It is located in the off touristy trails in Nha Trang and completely close to the nature. I’m really happy when you have had the wonderful time in Vietnam. Love to welcome you back! WOW, your villa looks INCREDIBLE! Need to get to Vietnam, it’s always been high up on the list. Gorgeous photos. It really was incredible, so beautiful and luxurious! 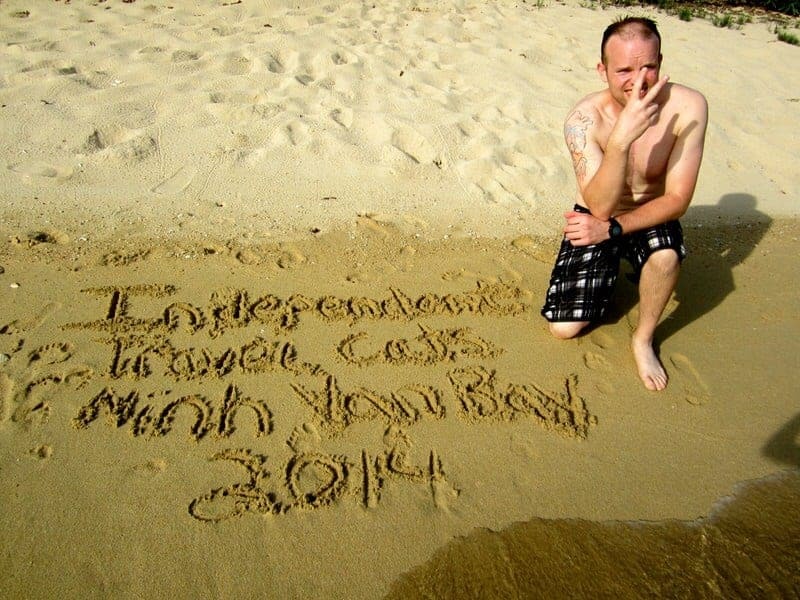 You’re welcome, glad you enjoyed the photos of Ninh Van Bay! 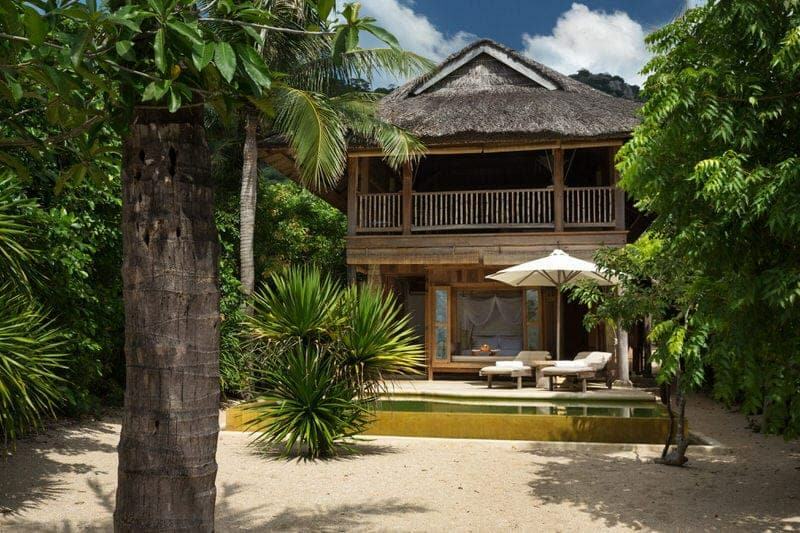 Six Senses at Ninh Van Bay looks stunning! Breathtaking view and gorgeous place to stay at! 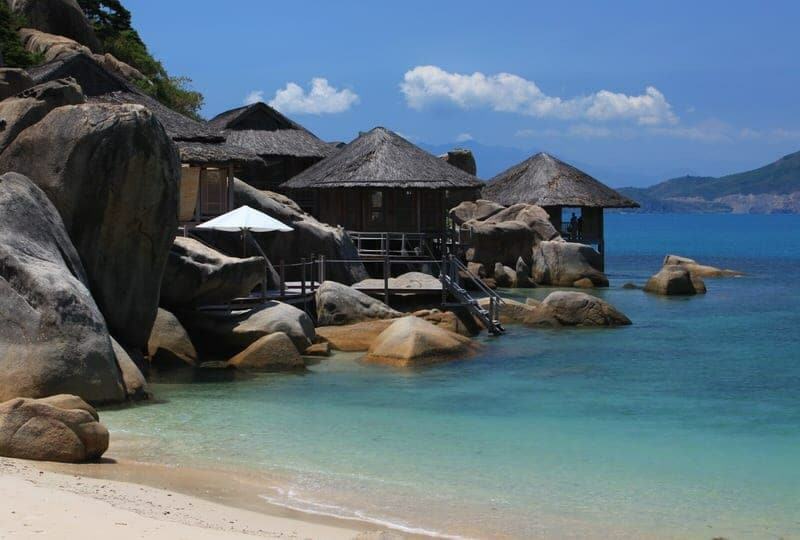 Six Senses Ninh Van Bay, and from what I can tell all the Six Senses properties, are just so gorgeous. It was hard to look around and have a bad view! That looks like an amazing adventure, I love the pictures. Thanks, it was a great place to relax! Oh my word. 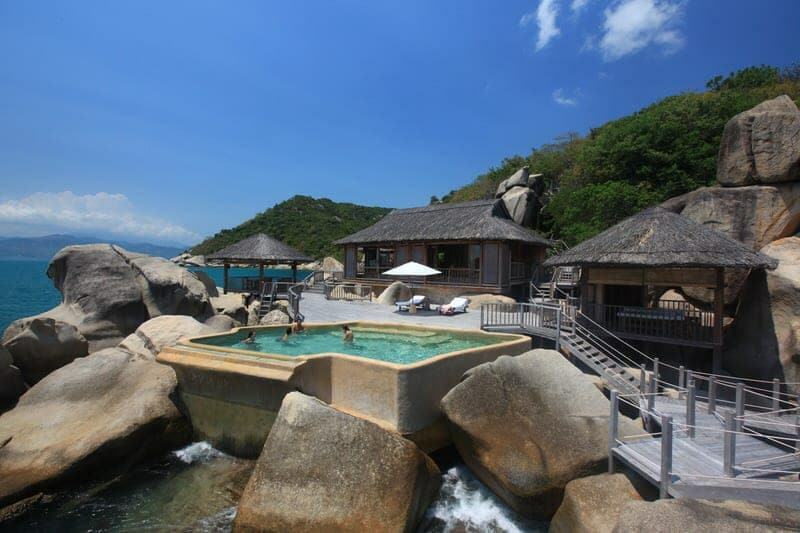 Six Senses Ninh Van Bay looks like a dream come true! Your own private swimming pool? Those views? I can’t even imagine. To say that I’d love to stay at this resort would be a massive understatement! What lucky travel cats you are!!! Wow! What a heavenly place to stay. All the villas look great, but the waterside and hilltop would be my choice……if I could afford to stay. : ) I like that you can have an active holiday, or completely relax. Lizards are cute so they wouldn’t bother me. It’s a shame about the communication with the staff, you would expect for the cost of the resort that they have staff who speak and understand English. Otherwise, all looks wonderful! Yes, we thought the lizards were cute too and didn’t mind a few bugs here and there. But I imagine there are people who find this totally unacceptable in a luxury resort, but those people don’t belong here I think:) For the staff communication issue, it was just one women we think who was answering the phones, and it was frustrating, but otherwise we had really good staff experiences at the resort. Hill and water…both different but great views! Um that place is incredible! And while you may not have done everything you wanted to do, it looks like you a had a great time! I’d love to stay at a place like that! We definitely had a great time and are lucky to have gotten the chance to stay here. We’d love to return and do all the other activities. They have a snorkeling trail mapped out by some experts and we really wanted to do that but there just wasn’t room to fit everything in and still relax. I spent 2 months in Vietnam cycling across the country and I did not hear about this place. That’s a pity! It offers beautiful landscape and so many great things to do on the beach!! I’m so jealous! Enjoy it!! Thanks Agness, we definitely enjoyed it. 2 months cycling in Vietnam sounds lovely! We were just there for a little over 2 weeks, not near enough time! This place looks truly amazing – a little bit of paradise 🙂 It seems like it would be worth making a bit of a splurge, especially if it was a special occasion or the big one for the trip (usually my habit). I am especially impressed with the effort and ease of the check-in/check-out process. That’s usually the most stressful part of visiting a more remote area, so I would think that would be a huge bonus. Wow, this looks amazing, I love Vietnam and I really want to go back and Ninh Can Bay looks stunning! Yes, Ninh Van Bay is really stunning. We also thought Nha Trang looked really nice but only got drive by views, hopefully can explore the actual city more on our next visit. This resort looks like heaven. 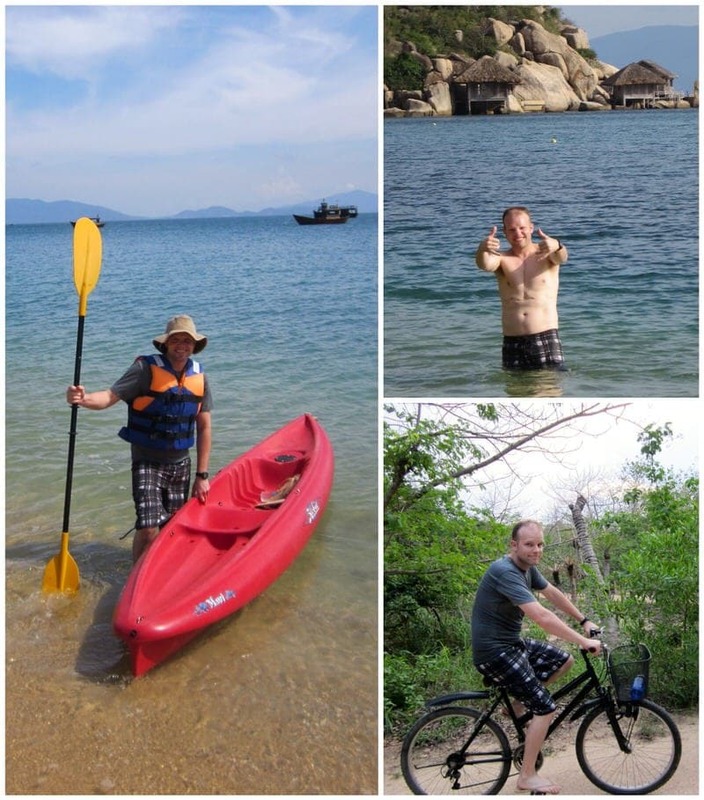 I have heard about the amazing beach resorts in Vietnam, but hadn’t really seen a proper review or pictures, thanks for sharing. 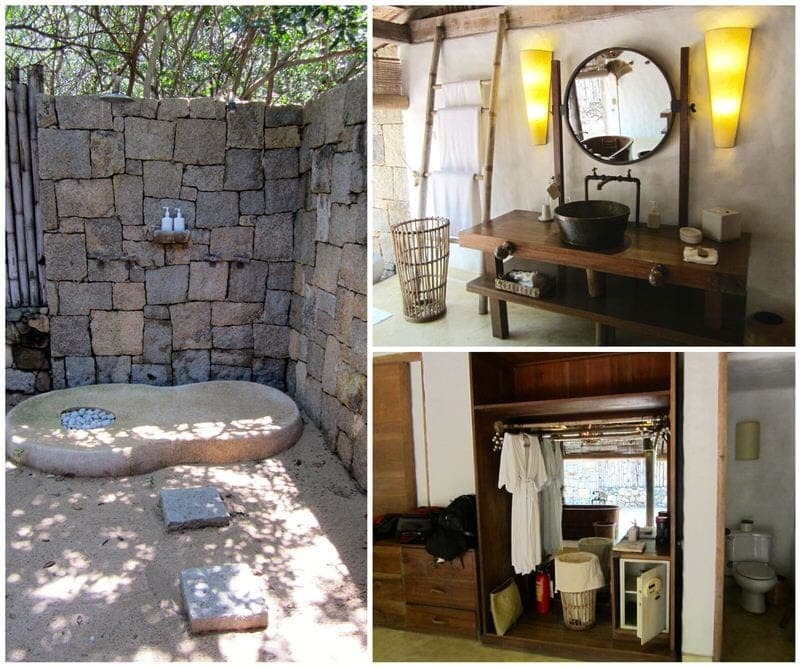 I really love the concept of the outdoor bathroom and have never seen anything like it before. Is it all 100% private? I still think I would feel a tiny bit uncomfortable being naked outside! I wish I was here right now! Hi Sammy, yes, we hadn’t seen any “real” photos either before we went to the resort. Some of the photos we posted are taken by the resort and included in their press kit, but most are our own photos (happy to send photos of anything specific to anyone interested, just email us as we took hundreds of photos ourselves). So the flush toilet itself is inside a little room with a door so that specific area is small but completely private (thankfully!). The closet, sinks, and wooden bathtub are sort of in an open air area (enclosed on three sides) and then the shower is completely outside. There is a fence around the yard area where the shower is so it is quite private and we never had any concerns here about people trying to peep into these areas. Jessica, That place looks amazing! I want to take a bath there, and go swimming, and eat, eat, eat! Well, the Senses Ninh Van Bay is definitely off my budget right now….maybe in a few years or if I win a lottery any time soon 🙂 I loved how the bathrooms looks! And the rooms, and the beaches around! Just a gorgeous place to stay! Something I’d like to have for a honeymoon! There were several couples there on honeymoon during our brief visit. 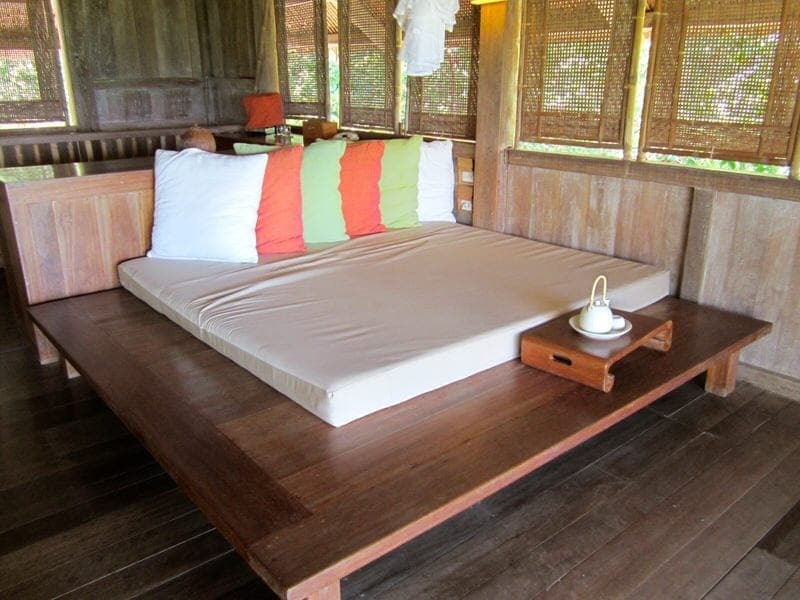 Nice secluded getaway where you can easily spend a lot of time in the villa and relaxing on the beach. No cars, no traffic, limited number of people. From our conversations with folks in the tourism industry, I think Vietnam is thought of like the Thailand of 15 years ago as many places in Vietnam are still undeveloped and relatively new to tourism. But places like Nha Trang are definitely on the tourism map, mainly with Europeans and Asian visitors though. I think many Americans find Vietnam an odd vacation spot still with the all the associations with the war; many people asked us why we were visiting before we left:) Highly recommend though if looking for a taste of Asia and it is a very budget-friendly location (luxury resorts and hotels excluded of course, haha) as we often stayed for about $20/night. These villas look like paradise! Yes, it really is like paradise, but sounds like you found a piece of paradise in Greece as well! Yes, I think it is hard to go wrong with the various villas, all come with great views and similar amenities. I really loved the open air bathroom a lot. We’re lucky to have gotten the opportunity to spend the night here! Looks amazing – I need to start playing (and winning) the lottery! Thanks for stopping by Ellen. Oh the places we could go if we won the lottery! Great place for a big splurge, like a birthday, anniversary, or honeymoon! Wow, this place looks amazing! Great article and love all the pictures. Thanks for the inside scoop on this getaway for the rich and famous!